Hello, Hello. Happy Sunday bakers, I hope you’re well. I’ve delivered and set up all of this weekend’s cakes, I’ve eaten my breakfast, done some housework, my son is all sorted and organised for school tomorrow, so I’m now sitting down to share the BEST vegan cake recipe with all you lucky lot. This is the ONLY vegan cake recipe you’ll ever need, it’s that good. Bold statement, I know. But I was so happy with this recipe when I baked it on Thursday I knew instantly that I had to share it on here. Regardless of the fact that I’ve got a million Sicily photos to go through and blog posts to start drafting, the cake recipes take priority! They always do. I’ve been baking vegan for quite a few years now having first picked up some amazing recipes from this book – Vegan Cupcakes Take Over the World and slowly but surely I’ve become more confident when baking vegan. Compromising on taste isn’t an option for me and I’ve tested so many recipes that end up being bland, too oily, too bread-like and just not very ‘cakey’. Ugh. This vegan cake recipe is everything it should be, plus more, and I owe a huge huge hug to the lovely Isabelle from The Rosehip Bakery (who creates the most stunning wedding cakes in Oxfordshire) for sharing the original with me and making me one very happy vegan cake maker. She has a notes section on her Facebook page with the original recipe right here where you can also take some time to admire hers and her daughter’s beautiful work too. If you follow my Facebook page or my Instagram account you’ll see all of my cakes are quite deep, generally around 5-6″ tall and this particular wedding cake from the weekend consisted of 8″ and 6″ sized tiers, each with 3 layers of sponge and filled with jam and vegan frosting too. 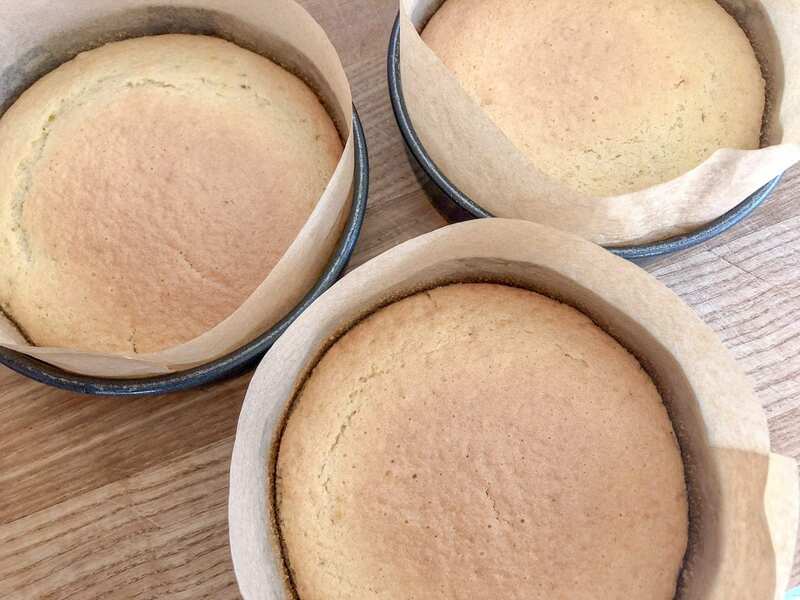 This recipe will yield enough vegan cake mixture to bake three 8″ layers each baking around 1.8″ high meaning once you’ve levelled them off when baked you’ll have nice even layers ready for filling and covering. It is very important to make sure you measure the ingredients exactly right, too much oil and just yuck. Too little oil or too little sugar… double yuck! However, it is very very simple to mix up. I used one large bowl and a wooden spoon. No stand mixer, just some good old fashioned mixing. It will take you 10 minutes maximum. No lie. Preheat the oven to 180C, 350F, Gas Mark 4 & grease three 20cm/8″ tins & line them with baking paper. Set aside. Sift the flour & baking powder into a large mixing bowl, and then stir in the caster sugar. Add the oil, water & vanilla extract & mix well with a wooden spoon, until the mixture is smooth. Divide the mixture equally between the prepared tins & bake for 25-30 minutes until golden brown or until the centre of the sponge springs back when lightly touched. Leave to cool in their tins for around 20 minutes before turning out onto a wire rack to cool completely. Whilst cooling add your vegan spread, icing sugar and vanilla into a bowl and mix/whiz up until smooth. Level each layer of cake, spread jam on each layer and pipe some buttercream on too. I actually made a lemon cake and substituted 2 tsp of vanilla for 2 tsp of lemon extract and grated some lemon rind into the mixture too. The best thing about this recipe is that it’s totally adaptable and you can add fruits such as strawberries/raspberries or even some vegan chocolate or cocoa powder. Let me know what you think and I hope you love it as much as I do. Tag me on Instagram with @cuppiesncream or #cuppiesncream so I can drool over your gorgeous creations. "Hand Luggage Only For A 10 Day Holiday"
Hi, do you think I could bake this in one tall 8” pan? If so would you suggest lowering the temp?